Maple and Rum Glazed Chicken is a dish that I made one evening out of necessity. I often order meat from a co-op and this particular evening, my cut up chicken had come completely defrosted. I needed to cook the chicken right away. Like many of you I work during the day, so I want a meal that is quick and easy to put together. In under an hour I had a new and delicious maple and rum glazed chicken. 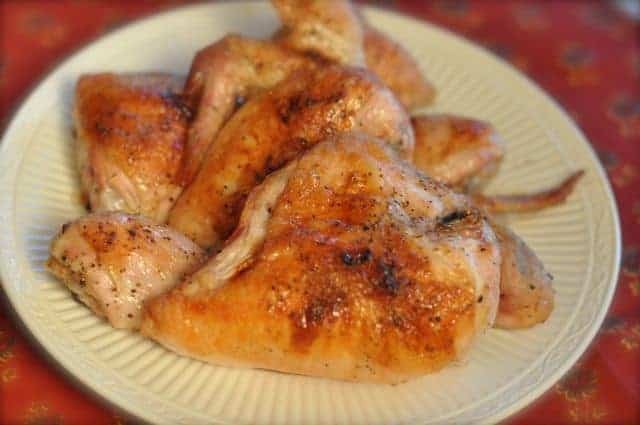 This chicken is very easy to put together, if you don’t have a whole cut up chicken, you could use a package of leg quarters, and they would be equally as good, and often you can find leg quarters for sale, so I may try this with leg quarters next time I make this recipe. I am using rum with this recipe, specifically, I am using Bacardi 151, but I think this would go well with a spiced rum or even bourbon. If you do not drink alcohol, you could use chicken broth or apple cider, this recipe would work well with either. You can make flavorful chicken that is glazed with maple syrup and rum. Place chicken on a bar pan, and blot chicken dry with a paper towel. Blotting the chicken dry will help make the skin very crisp. Drizzle oil onto chicken and season chicken with salt and pepper. Spread softened butter on chicken spreading as evenly as you can. Bake chicken for 30 minutes. While chicken is baking prepare the glaze. In a small bowl combine maple syrup and rum and whisk together. Season maple syrup with additional salt and pepper. Remove chicken from oven, spoon the glaze over the chicken, and bake for an additional 15 minutes, or until the chicken is done. The chicken is done when the thighs can be pierced with a sharp knife, and the juices come out clear. I am glad you enjoyed it. It is very easy to make, I am thinking your orange flavored rum has to be quite good.